Most days everyone in the house has to be out the door by 7am. And we have a diverse set of appetites: a 13 year old looking for an early morning sugar rush we would rather she did not have, a chronically late 16 year old ballerina that needs calories for 6 hours of dancing, my husband who works as much outside as at a desk and who could lower his cholesterol just a little to be safe, plus me, I need get lunches packed and fuel up for yoga class. Most mornings are a cornucopia of breakfast meal preparation including peanut butter toast with bananas, cheerios, Greek yogurt or a granola bar eaten on the school bus. All this is being made each morning with each individual making his or her own breakfast. Not exactly the worst breakfast meals but it drives me a little crazy as they are all in my kitchen as I am trying to get 3 lunches packed. So most days I am working around 2-3 half asleep individuals, a much in use coffee pot, and whatever messes my zombie-like family make. Irish steel cut oats, like the kind in the tin from McCann’s, are a really great morning breakfast option. They are low in fat, cholesterol and salt plus they are great source of both soluble and insoluble fiber as well as B vitamins. The complex carbohydrates in the steel cut oats have a very low value on the glycemic index and that will help to keep your blood sugar from spiking making you feel full longer. The FDA also says that steel cut oats can help fight heart disease, diabetes and some cancers. I am always amazed on days that I eat a bowl of steel cut oats and a small amount of protein (i.e. nuts) for breakfast that I don’t find myself looking for that mid-morning snack. 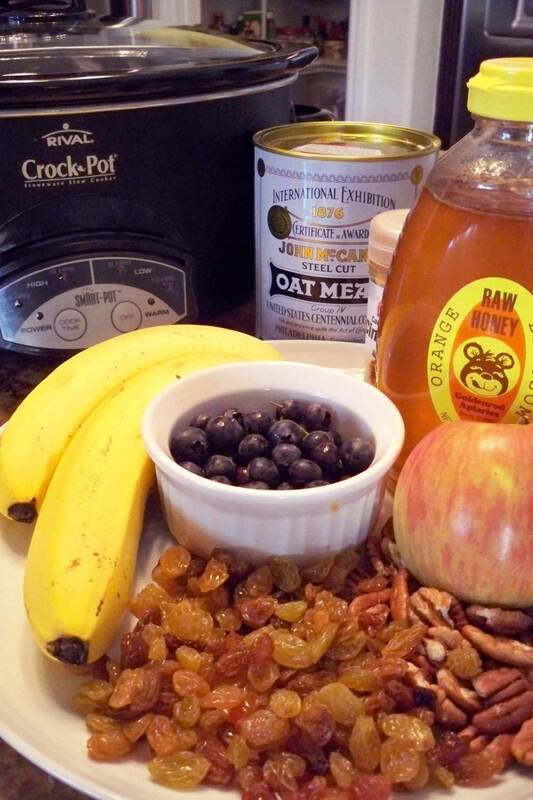 Bottom line is the plain oats are really good for you, so don’t feel too bad about adding a few yummy treats like raisins, honey or pecans to flavor them up. 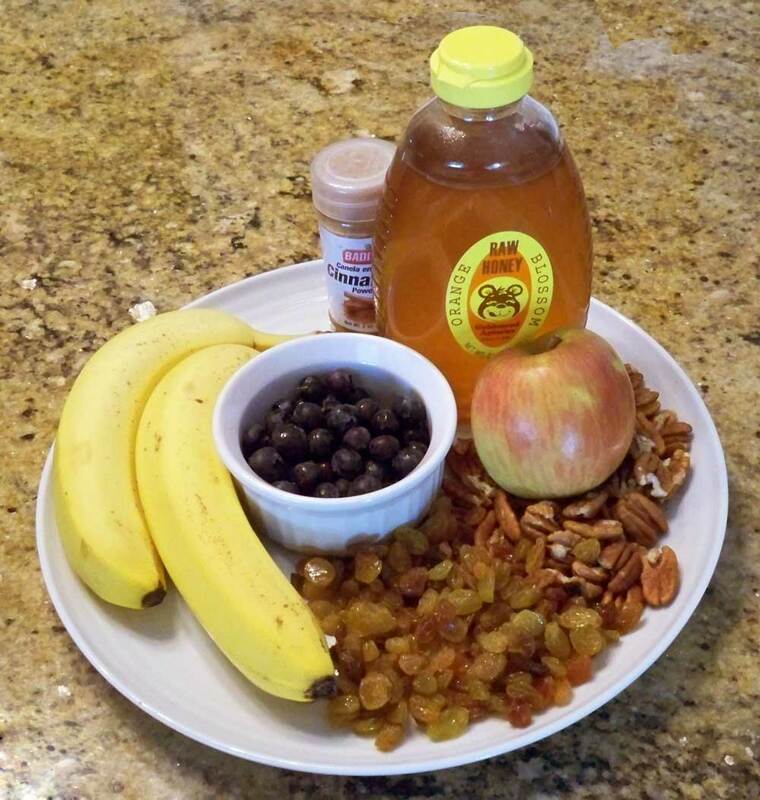 If you really want to feel like a dietary saint compare the homemade cereal to the McDonald’s Fruit & Maple Oatmeal with food additives like caramel color and sodium stearoyl lactylate and tons of sodium. Ok now it’s time to extol the virtues of low and slow cooking. We all know low and slow can take a big ugly hunk of pork and turn it into heaven but I never thought that low and slow could make a better bowl of oatmeal. But it can. And here is how. Take any slow cooker cheap or fancy and find a pyrex or corningware container that will hold about 6 cups, and will fit inside your slow cooker with the cooker’s lid on. Then mix the spices, liquids (milk or water) and oats in the pyrex. Place the pyrex inside the slow cooker, then pour into the slow cooker enough water to come about half way up the sides of the pyrex. Place the lid on the slow cooker put the temperature at low for about 8-10 hours. Trying to cook the oats in the slow cooker directly will not work well, they tend to stick and burn even on the lowest setting. Armed with my newly constructed bain-mari I decide that I was going to try to make a single breakfast meal that all four of us would eat, was healthy and I could make the night before keeping all of them out of my way in the morning. 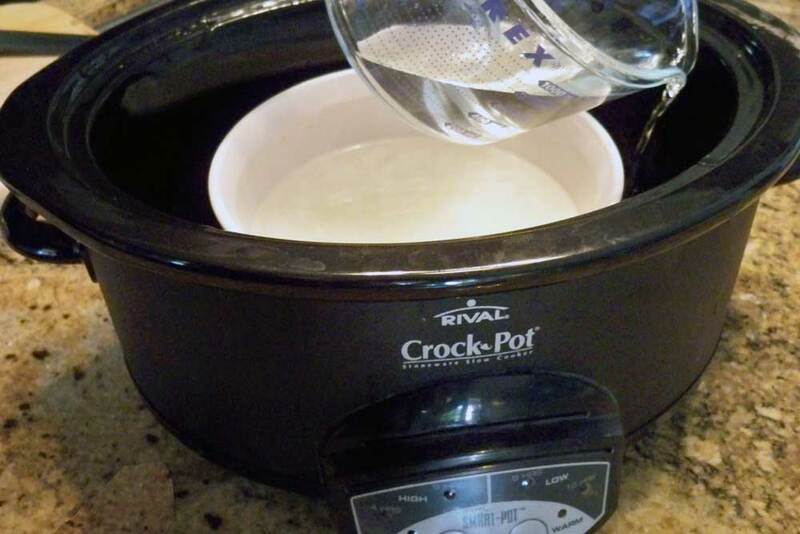 I set up my slow cooker on the breakfast bar in the kitchen put in the oats, milk, water, two tablespoons of butter and a few spices in the pyrex and gave it a stir. I placed the pyrex into the slow cooker and poured in the 8 cups of water I needed to make the water bath and put the slow cookers lid on setting it to low. Then I set out all the goodies that I would be giving my family to doctor up their individual bowls including: raisins, dry cranberries, pecans, cinnamon, and agave syrup. I went so far as to put out all the spoons, bowls and napkins they would need too. It took me less time to get this all ready than it took my husband to scrub the two big pots I had used to make dinner that night. Then off to bed we all went. Here is what your slow cooker will look like with the pyrex inside, then fill with about 8 or more cups of water to make the water bath. The water will come half way up the sides of the white container inside the slow cooker. Don’t forget the lid for the slow cooker. In the morning, I opened the cookers lid and in the pyrex was a perfectly cooked oatmeal with a small ring of golden brown at the top most edge, no burning or sticking anywhere. Overnight a magical thing happened to those oats, they were perfectly cooked: nutty and tender but with enough texture to be much better than microwave instant oatmeal. I like my Irish oatmeal a bit thinner so I poured in a splash of milk and I added a little more cinnamon so the aroma would tempt the morning zombies to give my concoction a try. I also added fresh blueberries and milk to the oatmeal topping bar. I gave the oatmeal a taste, and added enough agave that no one would accuse me of trying to feed them wallpaper paste and got to work on the school/work lunches. First one down was my husband, in all fairness he is up and hour or more before me so I can’t really call him a zombie as he has consumed half a pot of coffee by the time he heads back downstairs for breakfast after getting dressed. I sent him over to the Crockpot and he somewhat reluctantly scooped out a bowl, but once he added blueberries and pecans (two of his favorites) he was happy to sit in a chair at the table while sipping coffee and polish off a whole bowl. Next was the 13 year old, she much more zombie like blindly took a tiny scoop to indulge her new stepmother add her own favorite toppings sat down took a bite and promptly got up to get more oats and toppings when she realized how good it tasted. The 16 year old, liked it from all reports, I mixed hers up in a plastic cup and sent it with so she could scarf it down on the way to the bus. Mission was a total success! All were fed and no one messed up my kitchen or got stepped on as I packed up their lunches. In fact, I was so efficient this morning that I sat with my husband sipping coffee and eating my own bowl of Irish oats before putting the finishing touches on their lunches. This may not be our breakfast everyday but I think I can get them to go with at least 3-4 pots a month and that is a start. Hot cereal might be hard to get excited about come the 95 degree summer heat in Florida this August but until then I have a plan. Also another nice thing, you get leftovers!! Yes that’s right, one cup of dry oats will make about 8 servings and Irish oats reheat beautifully in the microwave with a little extra milk. So I will get two feedings out of this one overnight experiment. I have been making Irish oats for years on the stovetop so I have come up with a ton of ideas on flavoring them up so everyone can find a combination that they like. Below is the basic recipe I used in the slow cooker and a list of ideas for different goodies that your family might like. Enjoy!